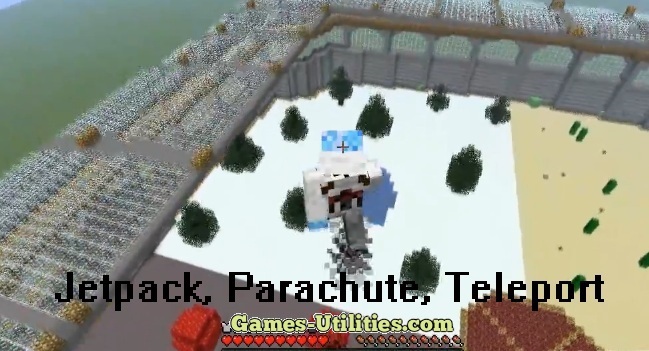 Jetpack, Parachute, Teleporter (also known as Duke605’s Adventure Mod) is now available for Minecraft 1.4.7. As the modification title suggests, it adds a fully functional and craft-able Jetpack, Parachute and Teleporter in your inventory you just need to mount ’em and you’re ready to go! It has unlimited uses, provides you ability to fall from heights without suffering any damage. Requires 3 srings & leather for crafting. Gives you a rocket powered vehicle with 24 seconds of flight time, you can travel one place to another using it. You need 7 iron ingots, 1 coal, and 1 gunpowder to make it. Can be refueled using right-click. Gives you ability to teleport (beam away) instantly from locations. Home switch requires 7 iron ingots, 1 redstone, and 1 ender pearl and Return Tele switch 7 gold ingots, 1 redstone, and 1 ender pearl. Both items have 50 uses. – Download the mod zip file from the link above. – Go to Start Menu > Run > Type %appdata%/.minecraft/bin and hit enter. – Open Minecraft.jar file using WinRAR. – Copy the mods folder in ./minecraft directory. – Delete META-INF folder and Launch Minecraft! This mod requires Mod Loader in order to function properly.